Amazon Simple Email Service (Amazon SES) is a cloud-based email sending service designed to help digital marketers and application developers send marketing, notification, and transactional emails. It is a reliable, cost-effective service for businesses of all sizes that use email to keep in contact with their customers. You can use our SMTP interface or one of the AWS SDKs to integrate Amazon SES directly into your existing applications. You can also integrate the email sending capabilities of Amazon SES into the software you already use, such as ticketing systems and email clients. Amazon SES includes features such as content filtering technologies, dedicated IP addresses, and a reputation dashboard help protect and enhance your sender reputation. Maintaining a good reputation ensures that your messages reach your customers' inboxes. Pay as you go, and pay only for what you use. There are no upfront fees, no time-consuming pricing negotiations, no fixed expenses, and no minimum charges. And, if you send from an application hosted in Amazon EC2, the first 62,000 emails you send every month are free. Use configuration sets to create rules that are applied to the emails you send using Amazon SES. 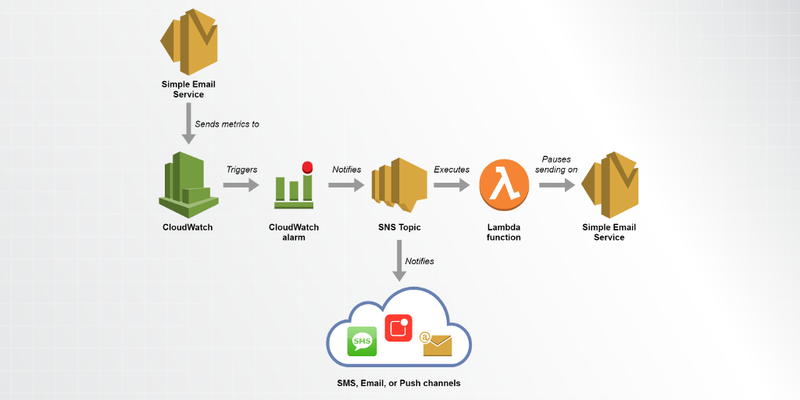 Send email metrics to Amazon CloudWatch for further analysis, or receive notifications through Amazon SNS. Keep your customers up-to-date by sending automated emails, such as purchase confirmations, shipping notifications, order status updates, and policy change notices. Keep your users informed by sending timely information, including system health reports, application alerts, and workflow status updates. Close the loop on your email program by using Amazon SES to receive email. Incoming email can be delivered automatically to an Amazon S3 bucket. You can use AWS Lambda to execute custom code when messages are received, or use Amazon SNS to deliver notifications when you receive incoming messages that contain certain keywords. Promote your products and services by sending advertisements, newsletters, special offers, and any other type of high-quality content your customers want to see. Ready to start sending email?